ENTER CODE: ds770 AT CHECKOUT FOR EXTRA SAVINGS! The quick and smart DS-770 sheet-fed document scanner is the ideal preference for business document management, providing world-class overall performance and versatility. able to scan at speeds of up to 45ppm/90ipm at 300dpi, and handle 100 pages at a time thanks to its automated document feeder (ADF), this effective, compact scanner offers a huge variety of media handling options that allow you to rapidly capture, index, store and share your commercial enterprise-vital files. The DS-770 can assist your company keep control over essential information, enhance the high-quality of your business decisions, and increase operational and process performance. Rapid, reliable data processing - Due to the need for the powerful automation of many back office and customer processes, the DS-770 scanner is designed to streamline document retaining whilst handing over high tiers of security, reliability and scalability, functions aided through a potential to capture images (300dpi) at rapid speeds. This is thanks to picture enhancement features including auto length crop, auto skew correction (tough edge) and color slip reduction, done by using a high-performance, dual-center CPU with hardware acceleration built in. Flatbed scanner conversion kit - Our optional flatbed conversion kit has been especially designed to combine perfectly with the DS-770, and takes up much less desk area than a conventional flatbed scanner. It permits a wide variety of media to be scanned effectively, together with postage stamps, passports, books and more. 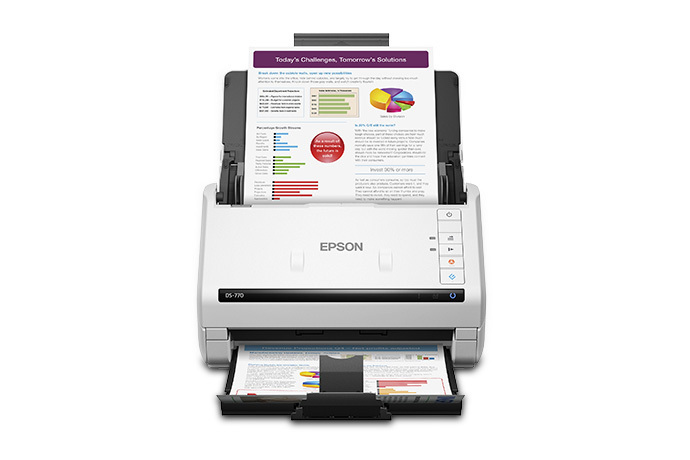 Powerful imaging technology - Effortlessly adjust pics at the same time as scanning, using Epson's picture enhancement software program, with de-skew and auto-rotate functions. superior functions such as barcode recognition and Zonal OCR permit quick document separation and clean file naming. Our Double Feed Detection bypass function permits difficult media – including envelopes or files with post-it notes – to be effortlessly and swiftly scanned, on the touch of a button, without being detected as a fault. in case your document is bigger than A4 in size, has an abnormal form, folds or wrinkles, or is a photograph or treasured original which you don't want to chance damaging, you could scan it using a carrier sheet. clever functions make certain the carrier sheet is instantly recognised via the scanner, so there's no need to modify settings, saving treasured time. A3 files are instantly recognized, and stiched back together digitally, ensuring a high exceptional scan every time. For demanding scanning requirements and high-output environments, Epson's -step scan method captures and sorts files in seconds thanks to superior, pre-defined parameters set by you. TWAIN, ISIS and WIA drivers as well as extra software plugins allow for seamless integration into your chosen document management systems, workflow systems and cloud offerings. Paper size Minimum: 2" x 2"